Modern Imagery is a photography and creative design studio located in the heart of downtown Bolton. Our fully equipped studio offers creative solutions for your personal and business needs. The Green Room is a comfortable space to keep belongings, relax and get ready for a shoot. This space is also set up with a makeup and hair section. Makeup artists are availablefor bookings. The Set is a large open concept space used as the shooting area. The space allows for different types of backdrops and settings in order to create the scene around the images being made. The Lounge space was created to make people feel right at home. The Lounge is a living room style space used for consulting with clients. This space is excellent for reviewing work on the large flat screen TV. 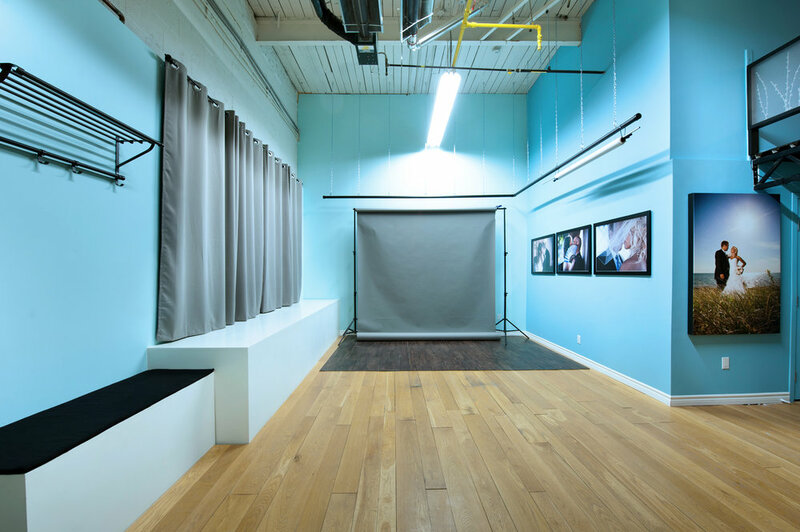 The studio design offers a comfortable environment for both shooting and consulting with clients. Contact us to learn more, or to schedule a showing of the space. To secure the space a non-refundable non-transferable deposit of $250.00 is mandatory for all bookings. THE PERFECT TEAM WORKING FOR YOU. With roots in concept development and layout, my graphic design skills have led me to the realization that I also have an eye and passion for photography. I set out to develop the technical skills to make good use of light and take eye-catching photographs. This has brought me to where I am today; serving the creative needs of the business community, capturing life moments and creating memories for couples and families. I have always had a creative flare for style. My makeup portfolio showcases work in many creative facets including film, print, theatre and the wedding industry. I am driven by creative expression. Maintaining long term relationships with clients, providing the very best in customer service and engaging with so many different people is the most rewarding aspect of what I do each day. Art began in my room... when I was five and my mother had to coax me out from inside of it. I was not seclusive; but if there was not an audience for me downstairs, I created one in my room. I improvised and performed scenes almost nightly. Eventually I took drama classes, performed on stage, played with film and television and will always love a good audience. I have come to love another art form dearly too! Photography. Mainly analog photography. Film. Experimenting with light, absence of light, movement, lack of movement, exploration, stillness, people, places, earth, nature and any one thing or moment that extemporaneously projects life as a photograph onto the canvas in my mind. Photography has been a constant love in my life. I bought my first SLR Camera in Amsterdam while on a backpacking trip in my university days. I haven't put a camera down since, it has become an integral part of my life and adventures. I love capturing other people's daily life and special moments. There is so much to experience through the lens of the camera, you can turn the ordinary into the extraordinary. Sometimes the seemingly simple image you capture can become the most poetic and artistic. The process of capturing and releasing the image is always so exciting for me. I continue to develop my artistic and technical abilities, I am truly following my passion on this journey. I focus my energy on building an inspiring and breathtaking film. I strive to create a fabulous cinematography experience and believe that every story needs to be told in a simple, yet beautiful way. Because every client is unique, my approach is a special blend of cinematic and documentary style production. My goal is to create a video for you that preserves all the best moments. Through my artistic and creative techniques, I incorporate the latest trends to reflect your individual style. I am a very passionate person which, I feel, makes me perfect for this career. I love to create and be creative, especially when doing makeup. Making someone look beautiful and having them feel beautiful is what I love to be a part of. I graduated from the Makeup for Media and Creative Arts program at Sheridan College which has prepared me for a number of different jobs. I've also taken hair classes which allows me to style hair as well as do the makeup. I've done a number of photo shoots, weddings as well as film work.